The most important part of a digital thermostat is a special resistor called a thermistor. Resistors are basic electronic components that resist the flow of electricity, slowing it down. Thermistors are special because their resistance value changes with temperature in a predictable way: the hotter it is, the more resistance the thermistor creates.. The thermostat runs a current through the thermistor and measures the resistance. It uses this resistance to calculate the temperature of the air in the room. That temperature is then compared to preset temperatures for the heater and air conditioner, if they are turned on. If the temperature is too high, the thermostat sends a signal into the air conditioner to turn it on. Once the temperature drops back below the threshold level, another signal is sent to turn it off. The heater works in the exact same way. Most digital thermostats have built in clocks which indicate time, day of the week, and sometimes date. These clocks allow users to set the thermostat ahead of time. Many users program the heat to turn down before they go to bed every night in the winter and turn up just before they get up. This saves heat while they are sleeping, and gets the house warm in time for them to wake up. 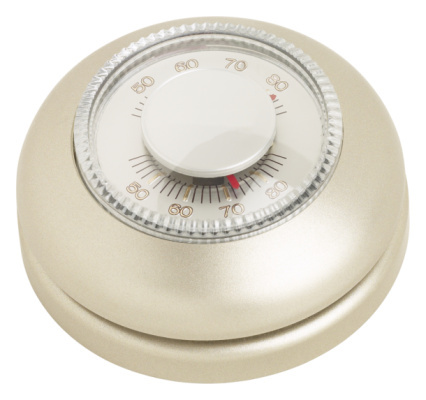 Some thermostats can also run different programs on different days of the week. That way, a user can program the heater for sleeping in on the weekend and for being gone most of the day during the week.